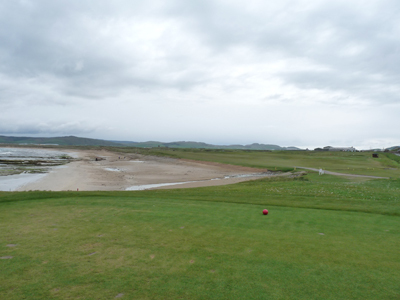 The 1st hole at Machrihanish Golf Club, feeling lucky? Have you ever stepped onto the tee and worried if you were going to manage to stay on your feet as you took a swipe at the ball? And I use the word SWIPE rather than swing, but after nearly two bottles of red wine and a couple of beers, swipe was the best I was going to manage. We are currently staying at the fantastic Ugadale hotel and cottages at Machrihanish Dunes and if you ever get a chance its somewhere I highly recommend you stay, it’s been beautifully restored and is right opposite the 1st tee at Machrihanish golf club. But back to last night, the food was excellent and the steak was cooked perfectly and the conversation flowed and so to did the wine. I knew I had to be on the tee around 9am for my 9.16 tee off, so I figured no problem. What are golf tours for, if not to enjoy great banter with friends, drink way way too much and play great golf courses. I managed to drag myself out of bed about 8ish quick shower, down to breakfast, where I was offered a stunning full Scottish, yea like I was going to be able to handle that. It was coffee and fruit for me, not sure why the fruit, I think you sort of have it because you know you should, be hey I’ll be drinking whiskey later so lets just go with it. I make the tee with 5 minutes to go, no warm up and I am now standing on the tee on the dogleg left 1st hole, with the ocean and beach to my left. If you’re feeling brave or stupid, you can cut off as much as you like to get yourself closer to the green. I was feeling both and still drunk from the night before, lets just say where is David Hasselhoff when you need him to retrieve that brand new Callway that you have just caned into the ocean nearly taking a treasure hunter out on the way, anyway 18 great holes later and I am off to the local distillery to see that whiskey being made, its what golf tours in Scotland are all about right!